Oval stones complete Pinterest’s top engagement ring looks from their 2018 Wedding Trends: Sweet and Simple report. The fancy shape took the #3 spot on the social site’s list with a 125% increase in popularity over last year. Read about the #1 & #2 trends: Moissanite and Art Deco. In recent years the oval brilliant diamond has risen in demand, and according to Town & Country magazine, is ranked 6th in popularity with American consumers in 2016 (round diamonds were still no. 1). The fire and brilliance of an oval diamond emulates that of a round with a bit of a twist. Its elegant elongated shape conjures sophistication and intrigue. There is nothing revolutionary about ovals. The shape has always been used in jewelry; however, it wasn’t until the mid-1950s that the modern oval brilliant cut diamond garnered mass appeal. Many of the rich and famous have opted for the opulent oval. Blake Lively wears a twelve-carat pink oval diamond from her actor husband, Ryan Reynolds. The stunning Lorraine Schwartz ring is rose gold with a micro-pavé diamond band. Julianne Hough also sports a Lorraine Schwartz design with her six-carat oval diamond engagement ring. Hough’s fiancé Brooke Laich proposed at their home with the elegant ring, which also features their initials and a heart in diamonds on the back. Before her breakup with Seal, Heidi Klum wore an approximately ten-carat fancy yellow oval brilliant cut diamond. Another Lorraine Schwartz piece, the ring was made in yellow gold and accented with smaller yellow diamonds. If you are looking to purchase an oval brilliant cut diamond for yourself or another, there are a few things to consider. If you are familiar with The Four C’s of Diamonds, that’s a great start. The same factors are used to evaluate the carat weight, clarity, and color for oval diamonds as with round brilliants and can help with your search. Considering the cut of an oval diamond is very personal. A 2009 survey conducted by Gemological Institute of America found that consumer and trade professionals prefer a longer, narrower oval shape. It showed the most popular length-to-width ratio was 1.7:1. It is challenging to find oval diamond cut to this proportion because of the shape of the diamond rough, so most ovals are cut to 1.3:1 or 1.4:1 ratio. While the proportion of an oval diamond is often a personal decision, the symmetry is objective. Poor symmetry in a stone will result in a dull and unappealing stone. Draw an imaginary line vertically along the length of the diamond and view each side – do the facet patterns mirror each other? Do the same across the diamond’s width. The outline of an oval diamond has a large impact on the beauty of the stone as well. Look for minimal variations such as an uneven outline. Look for the bow-tie. The bow-tie effect is unique to elongated brilliant shapes – oval, marquise, and pear. Since a diamond is cut to act as a collection of mirrors, reflecting as much light as possible, it also reflects shadows. The bow-tie often seen in these diamonds are a reflection of the shadow from the viewer (you). Look for an oval diamond that is well cut and has a minimal bow-tie. It is helpful to be able to compare a few stones side-by-side. If you are looking to create a piece that is enduring and unforgettable, an oval might be for you. Start your search for the perfect diamond and browse our selection. Ready to shop? Book an appointment with one of our trained associates. We've been reviewing Pinterest's result from their 2018 Wedding Trends: Sweet and Simple report. The top engagement ring trends are Moissanite, Art Deco, and Oval shapes based on increased in "pins" over the previous year. Art Deco takes the second spot on Pinterest’s list with a 173% increase in popularity. Art Deco describes a style of art and design that appeared just before the first World War and dominated designs from the early 1920s through the 1930s. This era influenced everything from building concepts to appliances to jewelry. The title "arts décoratifs" came into use in 1875 to describe designers of textiles, furniture, and other decorations; however it wasn’t until 1925 during Paris’s decorative arts exhibition, Exposition Internationale des Arts Decoratifs et Industrials Modernes, that the term “art deco” became widely use to describe the modern styles of the era. The designs that arose featured geometric and linear patterns that marked modern industry. Art Deco inspiration began in Europe and quickly exploded in American, then across the world. Completed in 1930, the Chrysler Building in New York City is one of several sky-scrappers of the time. From the lobby, to the elevators, to the distinctive crown - the seventy-seven-story building is considered a paragon of art deco architecture and design. The Chrysler Building - Carol M. Highsmith's America, Library of Congress, Prints and Photographs Division. The iconic Christ the Redeemer statue in Rio de Janeiro is a soapstone sculpture constructed between 1922 and 1931. It was created by a French sculptor and built with assistance from a Brazilian engineer, and French engineer, and a Romanian sculptor. The Art Deco influence can bee seen in the sculpture’s vertical lines and contrasting pedestal. Jewelry was a large part of the Art Deco movement. During this period prominent jewelry designers began to showcase common elements of this age: strong geometric shapes and patterns, contrasting colors, and vertical lines. In a departure from the diamond-dominated styles of the Art Nouveau and Edwardian eras, the use of colored gemstones like sapphire, emerald, and ruby became prolific. Black onyx, lapis lazuli, jade, turquoise, and topaz rose in popularity and were often carved or cut into cabochons. Additional materials were used including enamels and glass to create contrast in jewelry. 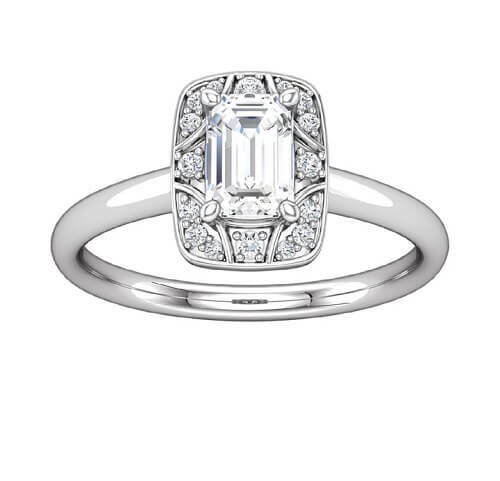 Art Deco and Art Deco-inspired are the most-demanded of vintage engagement ring designs. Intricate settings in platinum and white gold reigned during this period. Accenting colored gemstones created the era’s signature contrast, and bold lines were prominent. Feeling inspired by the styles of the Roaring Twenties? Art Deco jewelry is in high demand and vintage pieces are hard to come by, but not impossible. Put the word out to your favorite jewelers or dealers (did you know we have a selection of estate jewelry?). If you are looking for a specific design, many designers are replicating Art Deco jewelry. Book an appointment with us to start working on your Deco-inspired piece today! Pinterest has revealed some surprising results in their 2018 Wedding Trends: Sweet and Simple report. The top trends in engagement rings are Moissanite, Art Deco, and Oval shapes. The social media website has reported a 294% increase in “pins” or saves about moissanite gems over the previous year, making it the fastest growing engagement ring trend. Despite the uptick in interest, many consumers are unfamiliar with the diamond alternative. Moissanite is a mineral composed of silicon carbide (SiC). Although it is naturally-occurring, it’s more commonly lab-created, as it has only been found in upper mantle rock and meteorites. Today it is engineered as a diamond substitute; however it truly is a gemstone of its own. In 1893 the mineral was discovered by Nobel Peace Prize winning chemist, Dr. Henri Moissan in an Arizona meteorite crater. Moissan spent years trying to synthesize the mineral in his lab to no avail. It wasn’t until the 1990s that scientists were able to create silicon carbide crystals using an innovative thermal growing process. For over twenty years Charles & Colvard, the original creator of moissanite, has been using this process to create the gemstone for jewelry. Is it like a diamond? Not at all. The most important point is moissanite is a completely difference mineral than diamond. While both stones usually appear near-colorless, they have other very distinct properties. Moissanite does indeed make a great alternative to diamond. With a hardness of 9.25 on the Moh’s scale (second only to diamond), this gem is well-suited for everyday wear. The brilliance and fire of moissanite are also remarkable. The gem has a refractive index of 2.691 making it the most brilliant gem. Fire (or dispersion) is the material’s ability to split light as is passes through the stone, creating a rainbow effect. The fire in moissanite is extreme and surpasses that of a diamond. Because of the gem’s durability moissanite can be cut into numerous shapes, styles, and sizes. When considering a moissanite (or any gem) it is important to view in-person. Much like a diamond, you will want to look for a gemstone that has an appealing cut. Why should I consider moissanite? When you purchase a moissanite, you are buying a gemstone that requires no mining to produce, making it environmentally and socially friendly. Additionally, its origins are trackable, which makes moissanite a perfect eco-consciences choice. 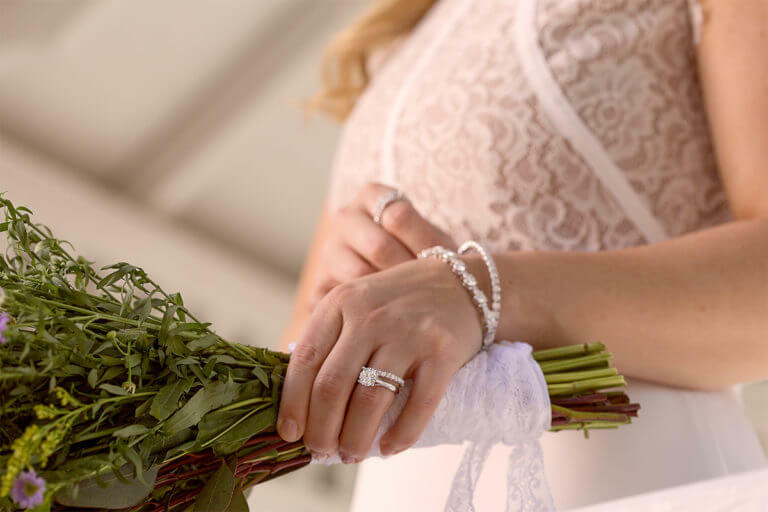 In addition to the unique physical properties and sustainable features, moissanite has an economical benefit. Moissanite’s price per carat is far less than other gemstones, diamond included. Moissanite prices vary depending on quality and size but are dramatically less than comparable diamonds. Whatever the reason you are considering moissanite, we can answer questions you may have regarding this brilliant and unique gemstone. Ready to browse? Visit our online showcase and see what is available!